After three amazing nights in Amsterdam, we left our roommate (Miep the cat) and flew to Dublin. Once we arrived, we picked up yet another car, but this time we were met with the challenge of our first experience of driving on the left side of the road. This took a bit of getting used to, but we eventually figured it out and headed towards Killarney. Along the way, we made our second family-related stop of the trip, this time into the town of Cork, where Nolan’s great-grandparents were from. We had a fish and chips lunch in the town, along with a Guinness and explored a bit before continuing on our way. In Killarney, we stayed at the magnificent Killeen House Hotel, where Nolan’s family has stayed in the past. The hotel is still run by proprietors Geraldine and Michael, who were insanely gracious hosts and made sure we felt right at home. 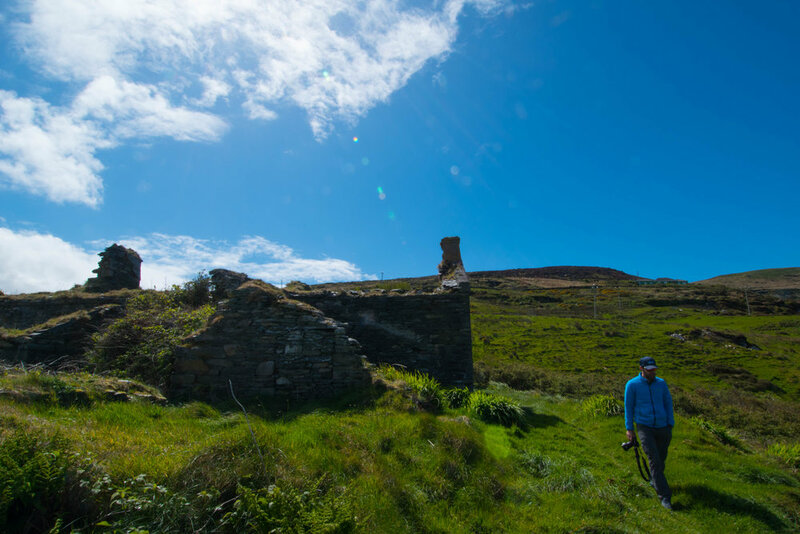 We spent the next day and half exploring this amazing part of the world: The Dingle Peninsula, Valentia Island, the Skellig Ring and the Ring of Kerry. We explored the sights on a rare bluebird day and the landscapes were some of the most stunning either of us had ever experienced. Where the narrow Irish roads allowed, we pulled over at every chance we got to snap a photo. 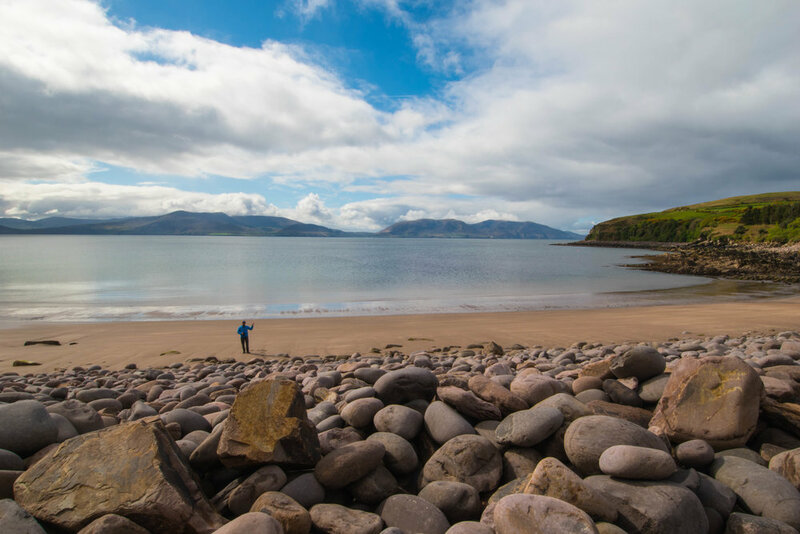 The highlight of this day trip was visiting the Minard Castle on the Dingle Peninsula, where we had the entire beach to ourselves. The photos and drone video cannot do it justice; it was incredible and an experience neither one of us will forget for quite some time. After an awesome two nights in Killarney, we headed into Dublin for a night. We explored St. Patrick’s Cathedral and of course toured the Guinness Storehouse, where we learned the history of the beer, how it is made, and how to properly drink it! While it was a bit touristy, it was a lot of fun and worth the trip. We flew from Dublin late (after our Guinness tour) and arrived in Manchester, England and were greeted by a wonderful Airbnb host who gave us all kind of tips on Manchester and visiting the Lake District, which we had intended to do on our first full day. We also got to catch the Anthony Joshua vs. Wladimir Klitschko boxing match, which had the entire country of England screaming at their televisions just as we arrived. On our last day up north, we grabbed coffee in downtown Manchester and decided to take the scenic route (the long way) to London. We stopped in the Cotswolds for lunch, which was incredibly picturesque and then drove to Stonehenge. While this latter stop was quite touristy and in the middle of nowhere, we are glad we took the time to experience it before making our way to foggy Londontown. We spent the next three nights in London, which had been on Kirby’s bucket list for quite some time and we had an amazing time! We stayed in North Kensington and had a blast hiring bikes to explore Hyde Park and the surrounding neighborhood of Notting Hill. We also had a proper touristy day of exploring Buckingham Palace, Big Ben, riding the tube and having afternoon tea. We even spent our final night taking sunset shots of the gorgeous Tower Bridge. London was also great because we were well-connected! We got a lot of work done, caught up with some of Nolan's old work colleagues and were even able to do some laundry, which was much needed…. We spent the better part of our last day enjoying the beautiful BA lounge at Heathrow as we anxiously awaited the arrival of our family and trip down to S. Africa!! We cannot wait to get the pictures and blog up from our week in South Africa. It was incredible, so stay tuned!